No matter how much we try to downsize, purge and live a simpler lifestyle, there always seems to be a need for more storage. This is true both inside and outside of our homes where the fight against clutter can seem like a never-ending battle. Our outdoor living areas are meant to be welcoming, relaxing spaces where we can entertain guests, spend time with family and unwind at the end of the day. However, when clutter begins to take over, our patios are no longer places where we can comfortably relax and are certainly not something we want guests to see. However, our kids have to have toys, we have to have garden tools, party hosts need their entertaining supplies, and our dogs need their food, toys, beds and treats. Since we cannot get away from needing the stuff that helps us maintain our yards, keeps our kids and dogs happy, or enhances our enjoyment of our outdoor living areas, we have to come up with ways to store all of these items so that they are out of sight but close at hand. If you are one of the many who are in need of more patio storage for toys, tools and anything else, here are 17 creative storage ideas to get you started. Deck boxes are specifically made for outdoor storage, so this is a tried-and-true option but not a super creative one. However, it is worth mentioning, since deck boxes are affordable, easy to acquire and will definitely get the job done. Deck boxes are particularly good for storing patio cushions, since it is a closed environment where they will stay cleaner and unaffected by inclement weather. Storage benches are a perfect choice for folks with limited space. This dual-purpose patio furniture option provides both seating and hidden storage in a single footprint, so if you have a small patio, don’t waste space with seating that only provides a place to sit. Instead, make sure you choose options with hidden storage under the seat. Even if you use other, more creative patio storage ideas, this is an easy option that expands your storage and should be incorporated into any outdoor living space that needs extra storage. Ottomans and short stools can be even more versatile than storage benches and chairs. These smaller, multi-function pieces of patio furniture can be used as side tables, seating, footrests and – if you shop smart – hidden storage. There is really no reason to purchase an ottoman that does not have storage, since options with hidden storage under the seat are so common and easy to find. If you are going to have ottomans in your outdoor living areas, make sure they are storage ottomans. In some cases, this might be all of the patio storage you need. Coffee tables and side tables already serve a necessary function by providing a surface on which you and your guests can set your plates, wine glasses or coffee mugs. They can also be used for playing board games, making craft projects or working on your laptop. Wouldn’t it be nice if you could simply store your board games or craft supplies inside the table instead of hauling them in and out of the house? With a storage table, you can use the storage compartment to hold your paintbrushes or puzzles so that you can keep them right on your patio. Rolling bar carts are almost a must-have for party hosts who entertain both indoors and outside, but they can also be used for other purposes. Aside from holding liquor and glasses – which they do very well – bar carts can also be used for other patio storage solutions, such as holding party supplies, plates, napkins, silverware and serving trays. When your party supplies are in use, you can use your storage cart for serving appetizers, desserts or drinks to your guests. Found space is any usable, existing spot that you can transform into storage. For example, if your outdoor living area has a raised deck or stairs, there may be dead space under the deck or staircase that could easily be transformed into a storage area. Finding this type of creative patio storage space is often even better than smaller options like storage ottomans or deck boxes, since you can sometimes store much larger items in these hidden spots. The photo below shows a fantastic use of found space under a staircase leading to a deck. Canopy sheds are not the most attractive storage options on this list, but they are super affordable, incredibly easy to set up and offer an immediate storage solution for both small and large items. These portable sheds are available in a variety of sizes that go from just a few square feet to canopies large enough to use as carports. So, this is one patio storage option that might work for you no matter what you are trying to store. If you happen to have an old, soft-sided greenhouse that you no longer use for growing plants, you can also repurpose it for use as a canopy shed. Garden sheds are usually the best backyard storage solution and offer a secure, enclosed room where you can store just about anything. However, not everyone has the space or budget to install a full-size garden shed. For folks with smaller yards or budgets, mini sheds might be the right solution for you. Many of these smaller sheds are the perfect size for hiding trash cans or storing bikes in a side yard. Get creative with your patio storage by installing a row of metal gym lockers. 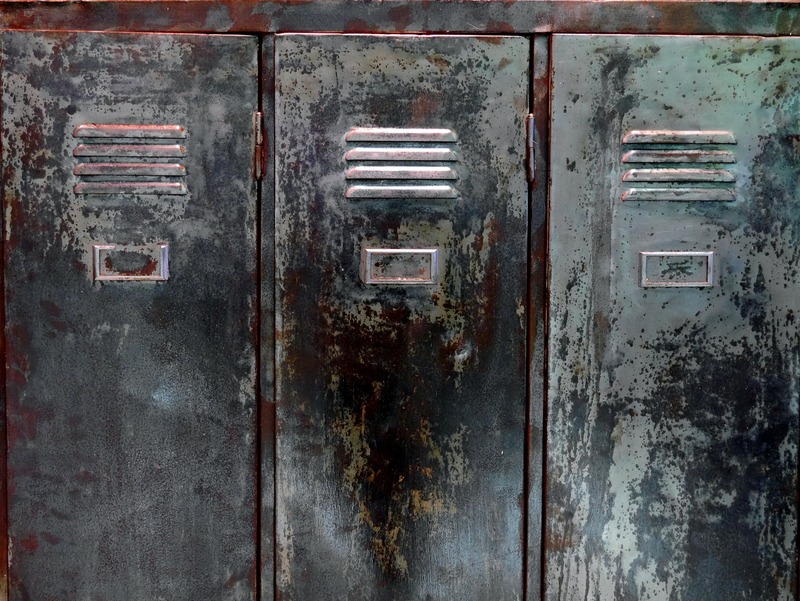 Salvaged school lockers can be cleaned up, painted and used for storing patio cushions, party supplies, children’s toys, pool chemicals or even as a locking liquor cabinet. This creative patio storage option could be absolutely free if you or someone you know happens to have an old bookshelf that is no longer needed. Leave it as is or give it a coat of paint, and then add a few baskets for a perfect, functional storage solution for toys, garden tools and other small items. You could also use a new armoire for patio storage, but vintage armoires generally have a charm that is not found in newer options. Armoires offer enclosed storage, which is important if your goal is to keep your patio clutter-free and have a convenient spot where you can store cushions, toys or entertaining supplies out of sight but within reach. Armoires with shelves and a locking mechanism also make great liquor cabinets for outdoor entertaining areas. Like armoires, dressers offer an enclosed storage option to keep clutter out of view. Since dressers have drawers, rather than shelves, they are perfect for storing linens, smaller patio cushions, toys, dog leashes or bathing supplies, towels for folks who use your swimming pool or spa, and outdoor entertaining supplies. Almost any type of basket can be hung from hooks on a wall, fence or eave to provide off-the-ground storage for smaller items, such as toys for children or dogs. Much like baskets, nets and hammocks designed for storing produce or toys can be used for patio storage. Unlike baskets, nets and hammocks keep items in view, so this is a better option for things that you are not trying to hide. Buckets can be placed on bookshelves, under benches, or hung on hooks or rope to provide patio storage that is easily accessible while keeping toys, tools or supplies organized. 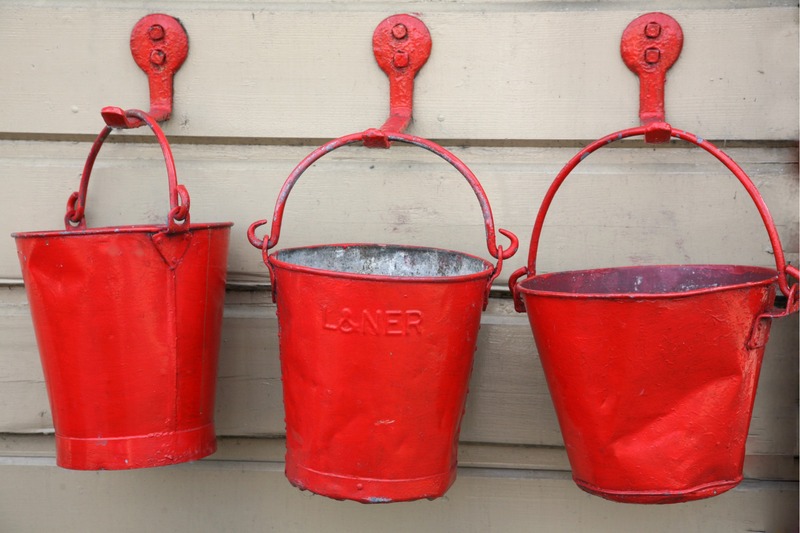 Since buckets are solid, they are good for storing things you want to hide and are a better option than nets or baskets if you have small things to store, such as Legos or toy cars. Paint labels on the outside of the buckets to easily find your garden tools and so that your kids will know where to put each type of toy when they help pick up the patio after play time. A murphy bar or murphy desk is a perfect patio storage solution if you have a wall or fence near your outdoor entertaining area. When closed, murphy bars look like small storage cabinets that do not take up much space at all, but once you lower the front of the cabinet, it reveals handy storage inside for your patio bar supplies, plus you have a flat surface that you can use for making drinks or setting out appetizers. If you choose a larger option and hang it so that you can use a chair or bar stool comfortably, the counter surface can also be used as an outdoor desk space for your laptop or other office supplies. If you are the creative sort, a murphy bar can be used to store art or crafting supplies, while the counter surface can be used as a creative workspace. Then, when you are finished working on your project, you can simply place your supplies in the interior storage compartment and raise the counter to have everything neatly tucked away out of sight. Planters with hidden storage compartments are a little more difficult to find than storage benches or ottomans, but they are still widely available in a variety of styles. Some have storage that is accessed by lifting off the top of the planter, while others have doors that open on the side of the planter to reveal a hidden storage space inside. Repurposed bookshelves are a convenient, fast option if you happen to have any extras laying around but, if you don’t, you can also make your own shelves out of just about anything that provides a flat surface. 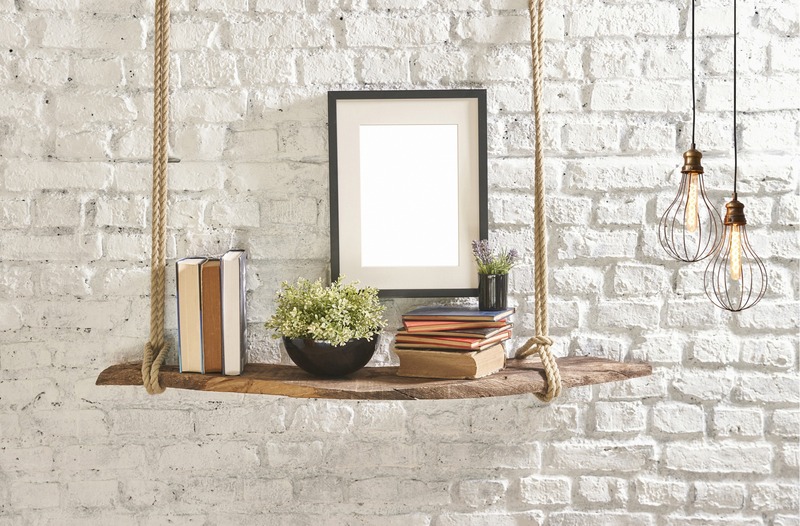 For example, you can take pieces of lumber left over from a home improvement project and affix them to the wall, hang them from your covered patio’s ceiling with rope, or combine them with cinder blocks to make an entire shelving system. You can also create a system of shelves and cubbies with inexpensive wooden crates. We all need more storage both inside and outside of our homes. What are your favorite, creative patio storage solutions?